The Holiday season is fast approaching! This means that it is also the season for Seasonal Clif Bars. 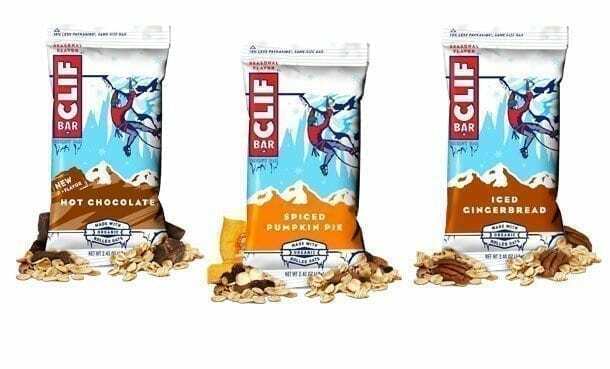 This year CLIF Bar special seasonal flavors return with three delicious seasonal flavors including Iced Gingerbread, Spiced Pumpkin Pie and Hot Chocolate! Like all CLIF Bar flavors, Hot Chocolate, Iced Gingerbread and Spiced Pumpkin Pie are crafted with 70 percent organic ingredients and are a good source of protein. All Clif Bar & Company foods have zero grams trans fat, and do not contain partially-hydrogenated oils, high fructose corn syrup, or artificial flavors. In addition, Clif Bar & Company only sources ingredients that are not genetically engineered. You can find the three seasonal flavors through December at your local retailers. But get them fast, as the limited-edition bars are only available while supplies last. Visit ClifBar.com to purchase the CLIF Bar seasonal flavors online or to find a store near you.